The classic design, fine quality paper, and sumptuous black silk moire binding with shimmering, foil stamped cover and matching storage box make this a fitting package for the precious record of the days you celebrate your union, and an instant heirloom. Printed and smyth sewn in Tennessee; box made in New Jersey. 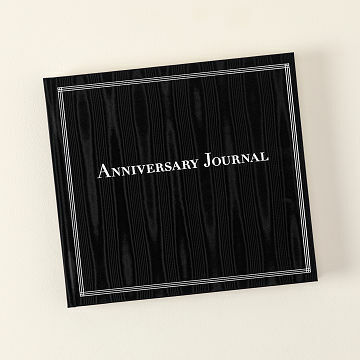 Check out the Personalized Anniversary Journal. We absolutely loved this for our anniversary. It was fun to recap all the events from our first year of marriage and write down our interests and some "inside jokes". We would definitely recommend this to everyone! I love that it has the same prompts for questions year after year. It will allow us to go back over time and read all the memories that stuck out in our minds when we're old and gray. Great quality book - thick, heavy, and lots of pages. The binder was a little deceptive. I thought it came with a place to put the four pictures that are shown, but it is just a blank page. I reprinted some small pictures to put in the album so they could see what was supposed to be on the blank page. My daughter and her husband seemed to like the journal. My brother and sister n law loved this journal! Overall, I'm pleased and look forward to filling this with a snapshot of our years together. The silver inscribing on the cover wasn't done very well though, and the book came with a couple spots already flaked off or just not imprinted solidly. Note that there is an envelope for keepsakes, photos or cards in the book on year one but then only included every 10 years after that. I was under the impression that the envelop was every year so was a little disappointed. We used this to reflect on our first year as a married couple. The prompts are fun to complete together and we are looking forward to completing this every year. I can see this book becoming a beautiful heirloom for our family! I previously made scrapbooks for my now-husband for each year we had been dating, but this is more sustainable and it accomplishes a similar idea. Lovely layout and concept -- bought this for our first anniversary and have now logged two years in the book. On that count, this is a great gift. The problem is you can't really put photos in the book as suggested. Once you insert just a few photos, the book becomes thicker than the spine, so it won't close fully and it won't fit in the lovely box the book comes in. Obviously i kept the book because i thought it was such a neat concept; we just don't have any photos in it. I'm still hunting for a book binder that can maybe rebind the whole thing. So, disappointing on that front. Obvious quality, will hold up to years of use. Cannot wait for my first wedding anniversary so I can write in this book. My co-worker is getting married soon and I plan on buying this for her too. What a great idea.